Dimensions in mm: 800(w) * 296(d) * 1109(h). Delivery: Free delivery on UK mainland. Please allow up to 2 – 3 days for delivery. Delivered for easy self–assembly. The Cotswold low bookcase is solid wood and finished in antique wax. and is made from Brazilian pine from ecologically managed forests. It has a pine ply back. This bookcase has 2 adjustable shelves. 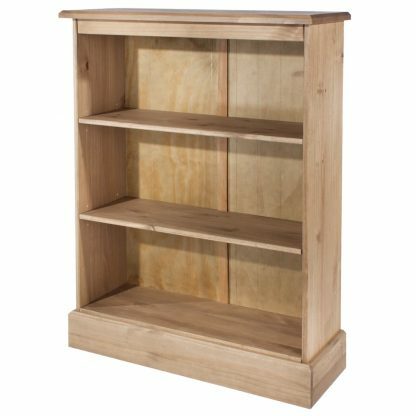 Delivery: Please allow up to 2 – 3 days for delivery of your new Cotswold low bookcase. Delivered flat pack for easy self–assembly with clear, easy to follow instructions.